Autumn marks the beginning of the fall leaf viewing season in Japan, a centuries-old tradition that’s analogous to spring’s cherry blossom celebrations. While most travellers are familiar with the excitement that surrounds cherry blossom season in Japan, many don’t realize that spring isn’t the only time of year when the country celebrates its natural beauty. The viewing of autumn leaves, known as koyo, is also a beloved annual pastime. Locals and visitors alike gather in popular koyo spots across the country to admire the fall colours. 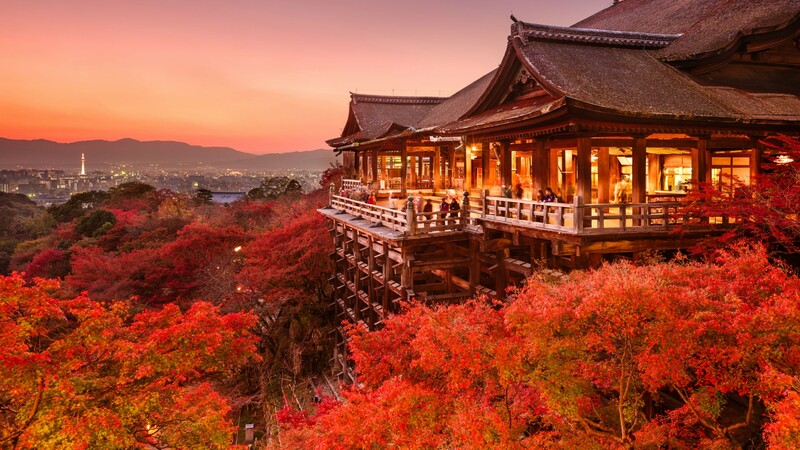 Kiyomizu-Dera Temple is one of Kyoto’s most famous destinations for koyo viewing. A UNESCO World Heritage site, this stunning temple dates back to the 700s and offers wonderful views of multi-hued maple trees framing parts of the temple complex. A view of the city of Kyoto, off in the distance, completes the postcard-worthy picture.